While I might quibble with their use of the term "quantum" (it actually means "really, really small" rather than "really, really big" as it does in popular use), this video describes an absolutely cosmic recipe for a delicious-sounding (not to mention gorgeous-looking) dragonfruit caipirinha cocktail. Looks like something Quark might have served in his bar. 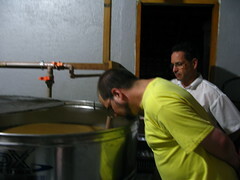 The final stop of the 2009 cachaça tour was Magnífica Cachaça. 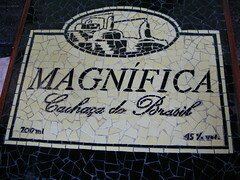 Every destination on this tour had more than just great cachaça to share -- each had it's own unique story as well. The cane is crushed twice, extracting every bit of juice. 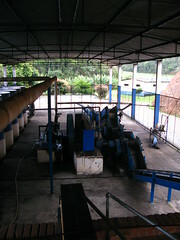 The conveyor belt then moves juiced cane (the bagaço) to a bin that fuels a steam engine. After this point, the process uses little to no electricity. The steam engine not only runs the pumps that ferry the juice to the fermentation tanks, but also feeds a hose that allows the crew to steam-clean the equipment. 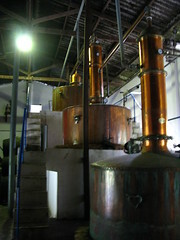 The still is a rare, tripartite alegría still, pictured above. 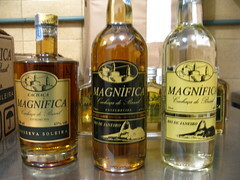 This process, once again, allows Magnífica to get every possible drop of usable product. 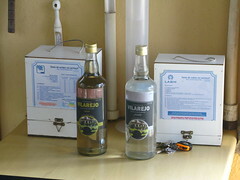 Only two alegría stills are currently known to be in use. All of this is in service of, well, a magnificent product. I came home with two of their oak-aged varieties, including a small flask of their Reserva Soleira, which spent three years in oak. My host, Laudimar Freire, also introduced me to ipê, a native wood that imparts minimal color and flavor characteristics, much like the amendoim barrels I found at Coqueiro. Lots more information in the video, which concludes the six-part series. Now that I have a few months' perspective on all of this, I'll be able to look at the entire 22-minute product a bit more objectively. Look for that cut in the coming weeks. Tuesday night was the finale of Cuca Fresca's Shake Your Way to Brazil cocktail contest, which I've been following with great interest. As fortune would have it, the contest took place just a couple of miles away from Cachaçagora's world headquarters, over at Chicago's Encore Liquid Lounge. My trusty Flipcam and I were in attendance, at least for a little while. Video below, with the five finalist recipes, plus the grand prize winner, after the jump. Update (2009-12-06; 1240): Another perspective on the event from Suburban Kamikaze. Update (2009-12-06; 1345): Check out this piece in The Examiner. Money quote for Cuca Fresca: "Sean Ludford, another of the Shake Off’s judges who has judged over fifty cocktail competitions, also said 'this was the most impressive line-up of cocktails that I have ever seen in a comparable competition.'" 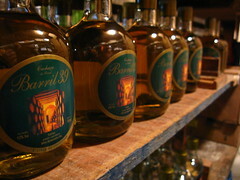 Here we have a very special installment of my 2009 Cachaça Tour documentary — a trip to Barril 39. Some of you may remember Barril 39 as the winner of the first blind taste test I held a little more than a year ago. This tiny operation, passed from late father to son, is undergoing a period of transformation and renewal. The horse-powered cane-crusher atop the hill will be replaced by a modern electric one. New structures have been erected to handle each step of the cachaça-making value chain — crushing, fermenting, aging, bottling — whereas a very small room handled most of these tasks before. Further, each building stands lower on the hill than the next, making gravity do some of work for the small distillery. All of this said, the old setup is a wonder of homespun ergonomic ingenuity. Proprietor Sérgio Azevedo's father originally arranged everything such that he could run almost all of the operation from his wheelchair. 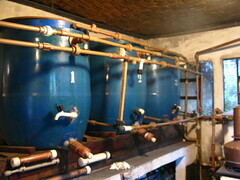 The fermentation tanks, for example, are smaller than usual and raised well above the floor, connected by a network of pipes and valves set within easy reach. Of greatest interest is the product I have yet to taste: Sergio sent me home with a bottle of Barril 39's one-thousandth distillation, carrying the old "Terras Altas" label, from which only a few liters exist. No, you can't have any. However, please enjoy the video and the slideshow. 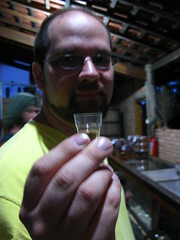 It's helpful to think of this part of the cachaça tour as a bit of an intermission. Why? Well, you'll find out in the video. 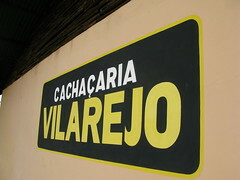 Vilarejo cachaça was the first one served to me by my in-laws upon arrival in Brazil this time around. I was impressed. What's been interesting to observe is how various distilleries make use of the bagaço ("bagasse" in English), which is the fibrous waste product that's left over from crushing the cane. 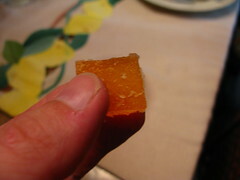 Vilarejo uses it as fuel to heat the alembique. Maria Izabel turns it into fertilizer for the cane fields. Magnífica (coming in part six) burns it to fire their steam engine. As for the rest, see the video and the slideshow. I saw a lot of great places during my five-day tour of Rio de Janeiro state's cachaça country, but only one could be fairly described as "magical". Cachaça Maria Izabel is located in a quiet, tranquil bay. To get there, you must brave a road that perhaps only meets the minimum definition of the word, that is, most rocks and vegetation are cleared away so that one place can be sorta kinda connected to another. Once you arrive at the distillery, however, you're a million miles away from everything else. We spent a morning with She-Whose-Name-Is-On-The-Bottle, Maria Izabel Costa, herself. 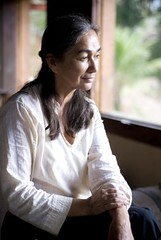 She is the serene cachaça earth-mother who watchfully presides over this blessed hamlet, pursuing her divine craft with a charming modesty. 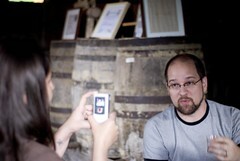 The tasting highlight was clearly an ultra-special batch that she kept in a large jug. She didn't say much about it save for the fact that, every so often, luck smiles upon this secluded cachaça grotto and all environmental and temporal factors come together perfectly. I imagine this is much like when some musicians describe a mental place they sometimes fall into where they simply cannot play a wrong note. And, like Eddie Van Halen's "brown sound" or Jimi Hendrix's tone on "The Wind Cries Mary", it is not likely to be imitated. Of course, I didn't leave without purchasing some goodies. First, some oak-aged 2007 special reserve. Then, some cachaça truffles and candy! For the rest, check out the video and slideshow. Right after Coqueiro, we trekked over to Engenho d'Ouro, getting there right at dusk. 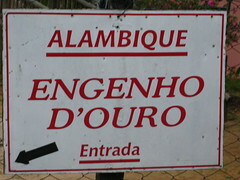 "Engenho d'Ouro" loosely means "Golden Mill". As far as I'm concerned, they might as well have been spinning gold at this place. Pure distillation alchemy going on there. In my explorations, one characteristic of some of my favorite cachaças has been the use of jequitibá rosa barrels during the aging process. Of course, that was the first offering from Engenho d'Ouro that I tried during my visit — and purchased. It is 90-proof worth of amazingness. I've hidden it in my special stash. Pressure sensors all around it. And dobermans. That wrapped up day one. Enjoy the video and the slideshow. As many of you know, I was fortunate enough to enjoy a five-day, six-stop tour of artisanal cachaça distilleries around Rio de Janeiro state in August. The result is a multi-part video travelogue that I will eventually post in its entirety. 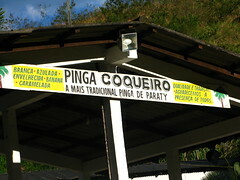 My first stop was Coqueiro, which I first learned about early in this blog's development. My Flickr-scanning uncovered a bottle of one of their flavored products, signed by Neil Gaiman. 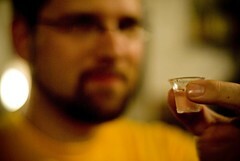 It's a cachaca from Paraty, they call their distillate 'Pinga' (english: drop) there. 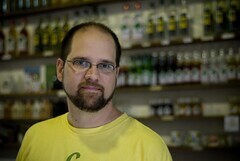 Coqueria sells a lot of cachaça's with flavors like pineapple and other fruits. 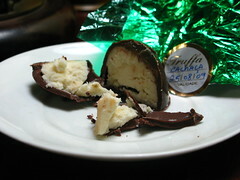 The one in the picture is probably a 'caramelizado' flavored with syrop. Paraty is traditional town on the green coast 150 km from rio de janeiro city with a great tradition for cachaça, they still have a dozen traditional distilleries (alambiques). Yearly they have their pinga festival. 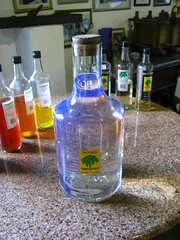 Coqueiro introduced me to a cachaça variety known as azulada. Essentially, it involves adding tangerine tree leaves to the fermented cane juice during the distillation process. 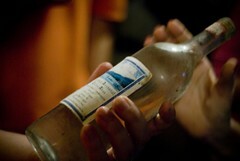 This leaves the cachaça with a light citrus taste and, when the light hits it just right, a heavenly blue hue. They sent me out to my next stop with a complimentary bottle in-hand. Let me tell you: making a caipirinha with this stuff is amazing. A ton of other possibilities, though my limited stash prevents me from doing too much experimentation. 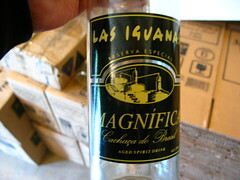 Little chance of me getting an azulada hook-up in the U.S., unfortunately, so I'm going to have to make my liter last. 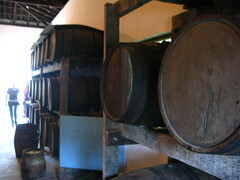 For aging the cachaça, Coqueiro principally uses two woods: the familiar oak and the more unusual amendoim. 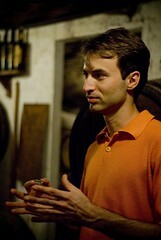 The latter (literally "peanut" in English, but with no real relationship to the actual legume) imparts minimal color and flavor characteristics to the cachaça. 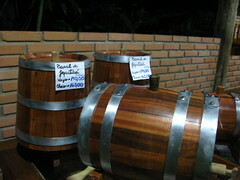 Ipê barrels are also often chosen for this reason. Enjoy the video and the slideshow. All slideshows will feature both my photos and my wife's. 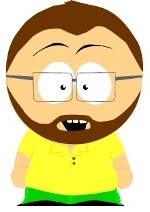 If updates have been scant around here, rest assured that things are going to be picking up fairly soon. Basically, I spent the last two weeks in Brazil. 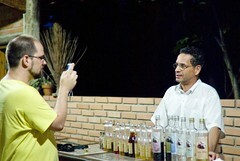 This culminated in a five-day, tour of six cachaça distilleries. Armed with my trusty Flip camera, I filmed a twenty-minute documentary, sharing the various things I learned along the way. The plan is to release an excerpt about each distillery over the next few weeks, culminating in the final edit of the complete work. Of course, I checked YouTube to see what other cachaça-related movies were out there. Verdict: Even with as much cool stuff as I learned, I'm not sure I can compete with this one. Sagatiba has some drink recipes courtesy of Marko Knezevic and Angelo Vieira. Out of all of these, I'm most intrigued by the Porto Alegre, which uses Campari.